Ms Swinitha Perera, secretary SAF Sri Lanka. 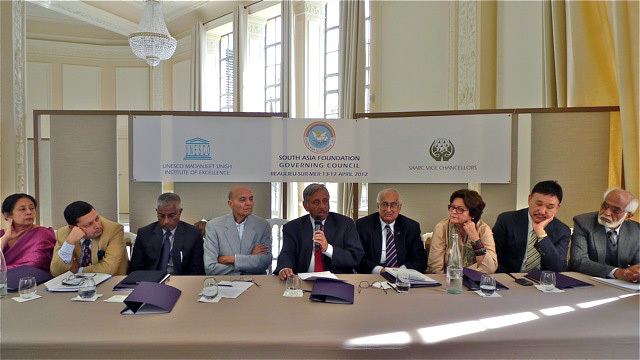 During the annual meeting of SAF Governing Council on 16th April 2012 attended by 42 delegates from all the SAARC countries, it was decided to establish another institution at the proposed Nalanda University in India and pledged a million U.S. Dollar as with the other UNESCO Madanjeet Singh institutions of excellence, It was also decided to promote inter-institutional exchanges of professors and scholars. Another important resolution unanimously adopted was to immediately admit Myanmar as a SAF chapter as Afghanistan had joined SAF in 2003.